20 Grams Of Protein Per Scoop To Help Promote Lean Muscle, Recovery & Growth! PREMIUM WHEY PROTEIN consists of concentrated pure whey protein which ensures excellent lean mass gains. 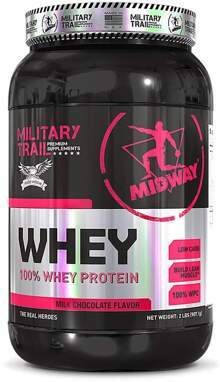 Say yes to protein and rest assure as WHEY PROTEIN Military Trail does not contain any Amino Spiking ingredients. Whey Protein supports lean body mass, contains absolutely no Amino Spiking ingredients and is Low Carb.